I can’t say as I know a whole lot about Armenia, but my Wikipedia e-mail for today mentioned that today is the 4505th anniversary of the traditional date of its founding. Mind you, I don’t think there’s any first-hand evidence for this, but I have to wonder how they decided on such a specific year. Actually, according to the Wikipedia entry, some accounts date it to 2107 BC instead. The more commonly cited year of 2492 BC is considered the official beginning of the Armenian calendar, although modern Armenian years date from 552 AD, when the calendar was altered to bring it more into line with the Julian system. Many founding myths involve the defeat of a giant or other monster, and the Armenian one is no exception. The name of the legendary founder is Hayk, similar to the name Hye that the Armenians use for themselves. A great-grandson of Japheth, who was in turn the son of Noah, Hayk was a man of huge stature who moved out of Babylon when the giant king Bel began imposing his tyrannical rule. “Bel” simply means “lord” in East Semitic languages, its equivalent in Northwest Semitic being “Ba’al,” and is used as a title for both gods and kings. Hence, I’m not sure this villainous monarch was supposed to actually have been NAMED Bel, and he’s frequently associated with Nimrod. Anyway, Bel, who hated to have his authority disrespected, led a force against Hayk, who had settled near Mount Ararat. Hayk raised his own army, and he himself killed Bel with an arrow from a longbow. 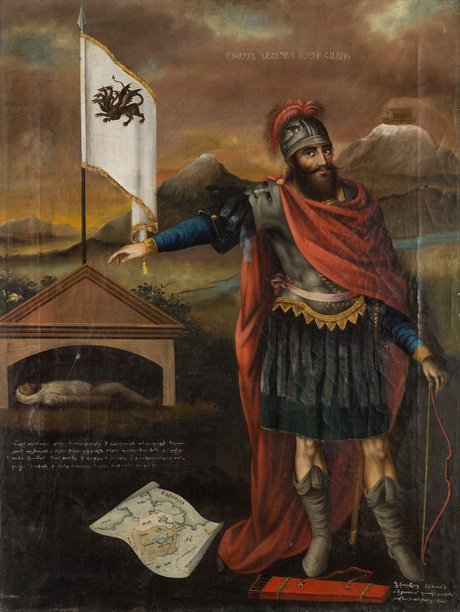 Hayk is considered the ancestor of many of the old dynasties that ruled the Kingdom of Armenia. This legend is known from the work of the fifth-century historian Movses Khorenatsi, but we don’t know exactly how far back it dates. Armenia is known for being the first officially Christian nation, adopting the religion in the early fourth century. Before that, their religion was a mix of Zoroastrianism with local paganism, and likely some influence from the Greeks and Romans as these empires ruled the area. The Armenian Apostolic Church, said to have been founded by the apostle Judas Thaddaeus, is not directly connected with either the Roman Catholic or Eastern Orthodox Churches. While the Republic of Armenia now has an official policy of religious freedom, the Apostolic Church is still given a special status, and Armenia is a predominantly Christian state surrounded by Islamic ones. Obviously the founding myth has Christian elements, since it involves the descendants of Noah mentioned in the Table of Nations in Genesis. It’s also said that Noah’s Ark came to rest on a mountaintop on 11 August, the first of Navasard (literally “new year”). Armenians apparently call the constellation Orion Hayk, and it comes into the sky around this time of year. According to the Internet, however, Navasard is no longer celebrated as the Armenian new year. I love how that page says, “The Church explains the decision by the fact that Hayk Nahapet was not a Christian.” Uh, yeah, about that…Christianity didn’t exist yet back then. This entry was posted in Bronze Age, Christianity, Etymology, History, Holidays, Middle East, Monsters, Mythology, Religion, Semitic and tagged armenia, armenian apostolic church, babylon, bel, bible, genesis, hayk, japheth, movses khorenatsi, navasard, nimrod, noah, noah's ark, orion. Bookmark the permalink.